This internship allowed for many opportunities to leave the office and explore the downtown Boulder area. Whether this was to deliver promotional packages to stores, take photos, or go to meetings, being able to get some fresh air in the middle of the day was always nice. This also allowed me to really take in everything downtown Boulder has to offer, and really get to know the shops and atmosphere. Something I really enjoyed doing was the Downtown Boulder Holiday Gift Guide, because I could browse all the shops for some of the best gifts! For a quick bite to eat I most frequently stopped by Boulder Bowls for a fast and filling lunch, but working downtown means the food options are endless. I also got acquainted with Freddie’s Hot Dog Cart, which has become a new favorite of mine. I had never been to Freddie’s in my 21 years of living in Boulder, but now that I have, it’s definitely a favorite. Food would not be complete without reminiscing on the wonderful dinner tasting that was put on for us by The Post Brewing Co., which was one of my fondest memories here at Downtown Boulder. 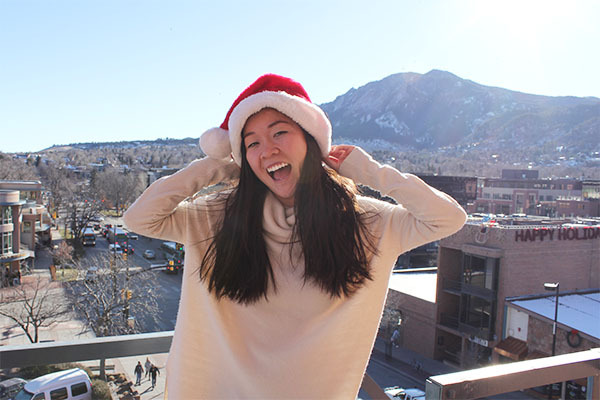 I had the thrill of interning at Downtown Boulder during the busiest time of year! In the transition from fall to winter something was always happening downtown. My first event was Boulder Craft Beer Festival, which had a large turnout and gave me a glimpse of a Downtown Boulder event! I have learned a lot through assisting promote all of these events, such as Girls Night Out, Fall Fest, Munchkin Masquerade, Shift 10, and many many more! Looking back, I must say I admire the hard work and dedication that Downtown Boulder puts into each and every event. Even though Boulder is my hometown, I can’t say I ever realized how closely-knit the downtown Boulder community truly is. This makes me even more proud to call this place my home, and I look forward to continuing my next semester here and seeing what Downtown Boulder does next. I have learned so much in my time here and am thankful for the warm and kind welcomes from everybody in the office!